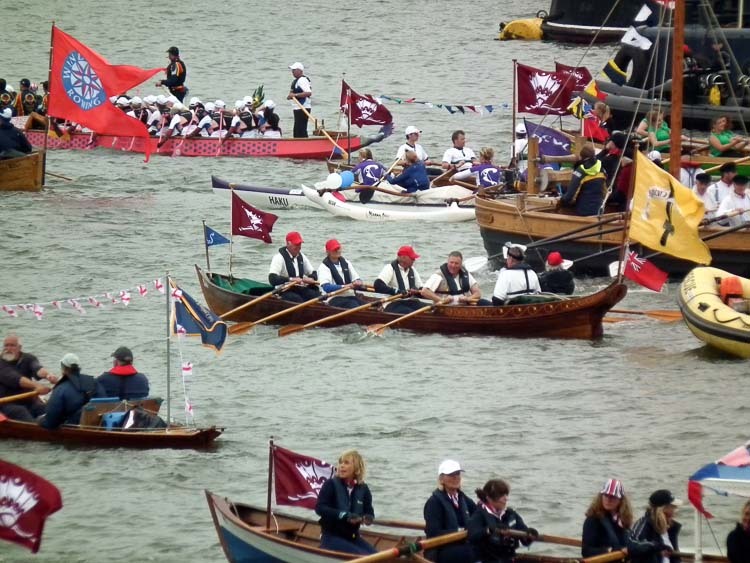 The quadruple skiff Sgian Dubh (Gaelic for Black Knife) was built for the late David Warren by Mark Edwards, who built Gloriana, and John Cox at Richmond Boathouse to take part in the 1994 Great River Race with his family as crew. The skiff has taken part in this race with various crews nearly every year since. David had originally wanted a triple skiff but was persuaded to have a quad by both Mark and John. The reason being that they had not built one before. She can be converted into a triple by moving the coxes thwart forward to just behind the quad stroke thwart. She can also be configured to have either thowl pins or swivels. David donated Sgian Dubh to the Society in 2001 for the use of members. She has also been taken by members on Summer Cruises to Poland and on the Canal du Nivernais in France.